When we meet and speak with our clients about the photos that they would love to get on their wedding day, bride’s will often tell us that they want a shot of their soon-to-be husbands reaction when he sees her walking down the aisle. This is a shot we get at every wedding, because this moment is special and very meaningful to the couple. 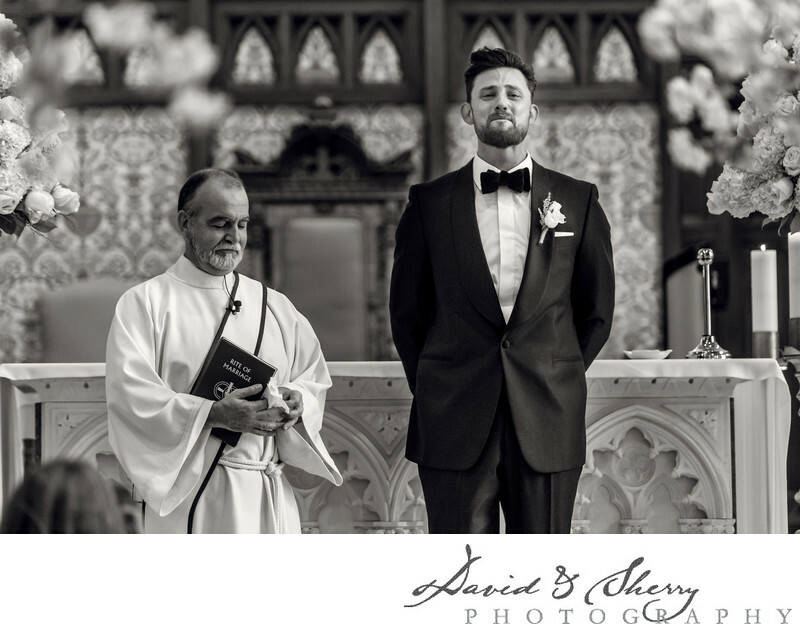 When the groom waits, dressed in his suit and tie at the front of the church for his beautiful bride, you can see the nervousness and excitement on his face as the bridesmaids enter the ceremony before her. Our cameras are always focused on the groom’s location at this point, because we want to get the expression as soon as he spots her for the first time. I have seen all sorts of reactions as soon as the bride enters the groom’s sight. Some men cannot contain the huge smile on their face as they stare at their future wife in amazement. Others-even the toughest and burliest of men-are flooded with emotion and tears fill their eyes, as well as the audience's. This is one of my favourite reaction shots, which was captured at an elegant Catholic church in Vancouver, British Columbia. I love the pride and passionate expression on his face as he stands at the front of the cathedral and sees his bride in her wedding dress for the first time.